Sylvia Lea (Brase) Walker, 78 of Junction City went to be with her Heavenly Family on March 28, 2019. Funeral services will be Monday, April 1, 2019, 2 pm at the First United Methodist Church with Dr. Dyton Owen officiating, with burial to follow at Highland Cemetery. Visitation will be Sunday, March 31, 2019, 1 pm to 3 pm at Johnson Funeral Home, 203 N. Washington Street, Junction City, KS. Memorial contributions have been designated to the First United Methodist Church, Friends of Animals and C.L. Hoover Opera House. Sylvia was born February 14, 1941 in Fort Knox, KY, to MSG Wesley and Mae (Culham) Brase. She lived most of her life in Junction City except when her father was stationed elsewhere including her favorite, two years in Greece. She graduated from Junction City High School where she participated in plays, was head cheerleader and class secretary her senior year. She attended Kansas State University, married David Walker in 1960 and began working as a secretary in the Junction City School superintendent's office. Sylvia began her Fort Riley career at Post Supply and moved to Headquarters as the Administrative Assistant to the Assistant Division Commander, a position she held until her retirement in 1968. She received many distinguished service awards while in that position. Sylvia then began her second career as a homemaker and mother where she expanded her talents to include sewing, knitting, crocheting, needle point, cooking, and raising two daughters,Valere and Dana. Sylvia was an active member of The First United Methodist Church in Junction City for over 60 years. She was a Sunday school teacher and choir member for many years. 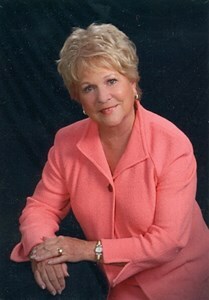 In addition, Sylvia was a member and board member of many organizations including the March of Dimes, Red Cross blood drives, Ladies Reading Club, Old trooper Ladies, YMCA, CL Hoover Opera House renovation, Junction City Country Club, and served on the Alumni Athletic Board at Kansas State University. She was a great cook and loved baking her amazing cookies for the troops. Golf was her second love, she was club champion for 15 years at the Junction City Country Club and Rolling Meadows Golf Course. Bridge and Mah-jongg were her favorite indoor activities. She taught classes on how to play Bridge and on etiquette. Sylvia loved to travel making several trips to Europe and Mexico, as well as Asia, Australia, New Zealand, Canada, Russia. She went to Alaska, Hawaii and most, if not all of the other states. Add your memories to the guest book of Sylvia Walker. I have so many special memories of Sylvia. Firstly, she was always there to help if anyone needed her. She had a beautiful smile and a fun personality. I can remember playing racquetball with her at the YMCA. She surprised us one day by making us shorts to wear while we played. She was concerned that we may not like them since they were homemade. Silly lady!!!! That made them that much more special. I was known as Rhonda Racquetball, another friend was Becky Backhand and Sylvia was Farah Forehand. Good times!! I have thought of her often and will continue to have a special place for her, always. It was a blessing to have Sylvia placed in my life. Our love, and prayers go out to all of her family. May God hold you close to him through this difficult time. Thank you for sharing a very moving celebration of life service yesterday. It was inspiring to hear how Sylvia had a treasure hunt for Kathryn, Samuel, Allyson and Matthew every time they came for a visit. What great memories to share with each other. I remember Sylvia always being so kind to me and am saddened by her loss to me but grateful we will have a heavenly reunion some day. Hearing "Memories" by Barbara Streisand and "Amazing Grace" by Neil Diamond reminded me of one of my favorite songs, "I believe". The lyrics bring me comfort, and I hope they will also bring comfort to all of you during this stressful time. know why, I believe. " The Righteous Brothers and Elvis Presley both have a YouTube recording in case you want to listen. May the Holy Spirit comfort you along this journey of grief for the loss of Sylvia. Stan and I are so sad to hear about Sylvia. Our thoughts and prayers are with you at this very sad time. We will miss Sylvia. She was always so thoughtful to us. David,Valere and Dana. Please except my deepest sympathy for the loss of Sylvia. My time spend in JC.. Sylvia was very special to me.. She was a fierce competitor on the golf course and a mentor to me in many ways. We lost touch over the years but I never forgot her friendship. Sending love and prayers to all of you. David may you be comforted by all the memories you and Sylvia made together. May she Rest In Peace and you know you have Mary and my sympathies, prayers and thoughts at this great loss to you and your family. Sylvia will be missed by many. Condolences to David and all the Walker family. Please accept my deepest condolences for your family's loss. A friend from Kentucky. Great memories with the Walker family ! My thoughts and prayers are with all ! Our family met David and Sylvia nearly 30 years ago during our annual Quail hunting trip to J C Ks. David and Sylvia treated us the best whether it was dinner at their home, the Harvest Inn etc we had a great time together. David and Sylvia’s trip to Sylvia’s Ole Ky Home was a special time for the Allen family, the Horse races at Keeneland, SEC Tailgating and U K’s game vs Fl with Sylvia cheering for Ky like she had been a Ky fan forever. Though she loved her K St Wildcats she helped us cheer on the Ky Wildcats. ( she was competitive ) Thanks Sylvia for making Ks feel like home to dad, Dr Bill and I. The Allen Family of Ky. Perry & Robin Allen - Henry & Anna Jean Allen & the late Dr Bill Holbrook. I’m so heartbroken over the passing of Sylvia, she was a beautiful lady inside and out. I have so many wonderful memories of her as I was growing up, she was always so kind, and I am so grateful that she was a part of my life, and a part of my parents lives. She will be missed so much, I will carry her in my heart, always. God Bless you all. David, Valere, Dana, and family...... my heart broke with the news. Sylvia was a beautiful woman inside and out. A room became brighter when she walked into it. I loved knowing her. There are people in our lives that we automatically associate with our childhood and Sylvia was one of those persons for me. Playing “Who’s got the Button” at birthday parties and having her teach Sunday school when we were teens are only two memories I will always smile at. She was one of a kind! You will cherish your memories forever. My heart and prayers are with you all. I send you hugs and all my love.